1989 was a very busy writing year for me, and September’s issue 9 was a communications special, for which I was asked to write several articles by the editor, Anthony Jacobson. You’ll see the rest of these articles under Amiga Calling – Comms Sizzling Special Report. 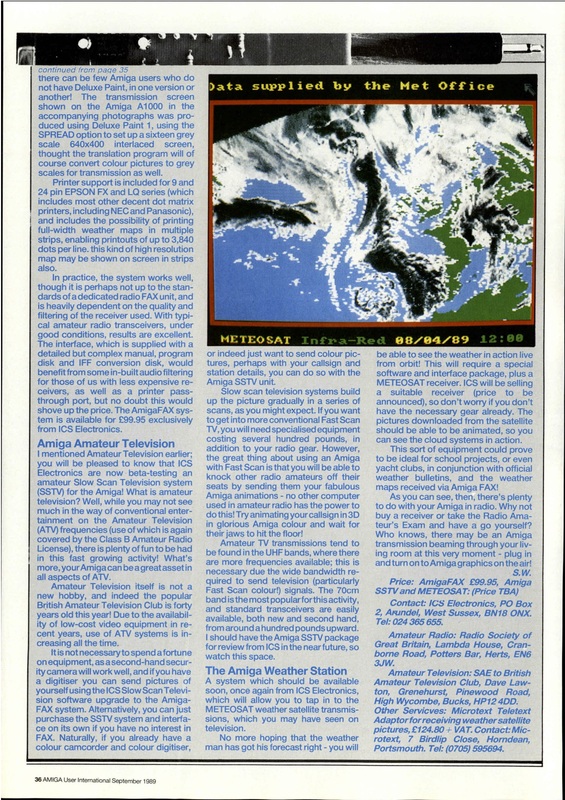 The third of these articles, ‘Amiga Graphics On The Air’, published on pages 34-36, was my introduction to amateur radio fax (image) and amateur radio slow-scan television transmission using the Amiga – and to the use of such equipment to receive weather satellite imaging. 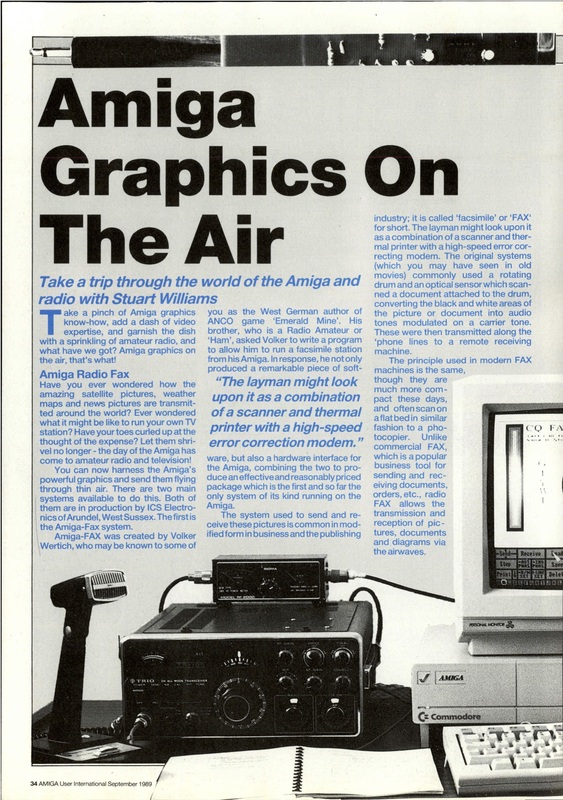 The equipment pictured in the article is my own much-missed Amiga A1000 and Trio 2m (VHF) transceiver, a great combination. The Amiga, with its multimedia capabilities and processing power, was very well-placed to take such imaging applications in its stride. 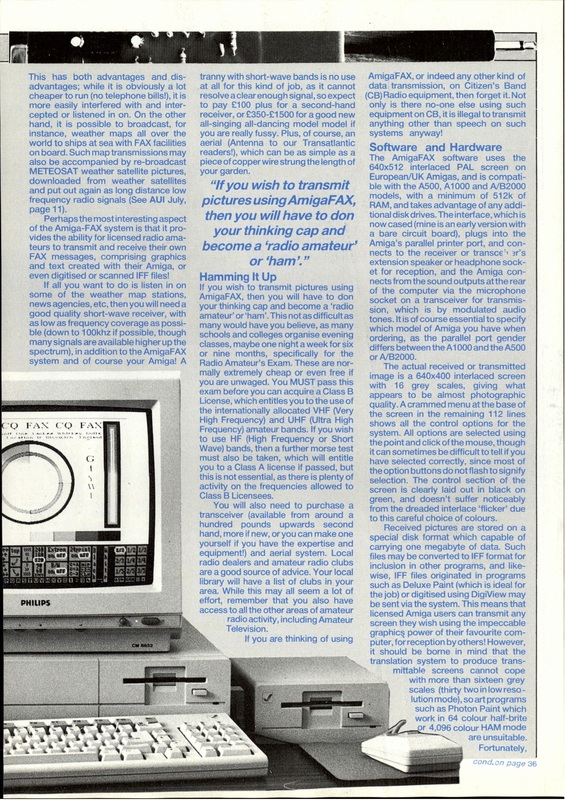 The other three articles, plus the AUI Compunet banner design competition which I was asked to devise, are also on here via the Amiga Calling menu sub-item ‘Comms Sizzling Special Report’. That’s four articles plus a compo contributed in one issue – not to mention my usual PD and shareware software feature!